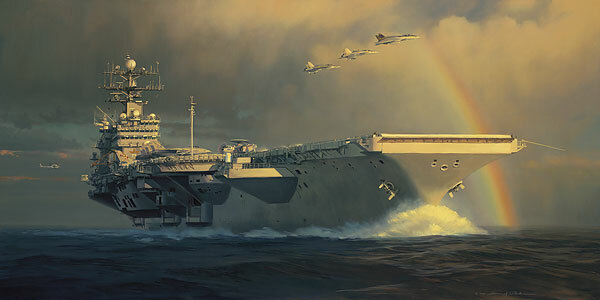 Following in the tradition of his previous aircraft carrier paintings, including Home is the Hunter, Threading the Eye of the Needle, Caping the Tico and America on the Move (several Sold Out at Publisher), William S. Phillips brings us the latest in his impressive fleet, reproduced at a “Nimitz Class” size. While researching Out of the Squall Line, Phillips spent ten days aboard the USS Harry S. Truman (CVN 75), where he was given the opportunity to see every aspect of the ship and its flight operations. In a personal challenge, Phillips included at least one portion of each of the Truman’s air wing in the painting. The Truman is the eighth Nimitz Class aircraft carrier authorized to be built by Congress, and was christened in 1996 in Newport News, Virginia. The carrier has a crew of more than 160 officers and 3,200 sailors, and recently participated in Operation Enduring Freedom and Operation Iraqi Freedom. This is a big year for William S. Phillips, with a U.S. Postal Service stamp program and a new aviation art book with Greenwich Workshop Press in the works. Start out the year by making a perfect landing on the super carrier of his stunning Out of the Squall Line.